The extra ‘s’ is intentional in the title. Mother’s Day started yesterday for me. Here’s a list of the things that have made the occasion special to me. My husband took the day off work. It’s very special to be able to just hang out together. We went to breakfast where I seriously wolfed down my hazelnut french toast in half the time it took him to eat his food. The Farmer’s Market opened for the season on a beautiful warm and sunny morning. I love the hometown feel of the Farmer’s Market in a town that isn’t small. I took a big nap. There was a mini jazz band festival going on in a few downtown restaurants. We went to our favorite Thai Restaurant and enjoyed dinner and a show! Then we strolled through a little antiques mall recently opened by a friend’s son, and lastly stopped for frozen yogurt – pomegranate raspberry. Deliciously tart. Slept in till 10 am. 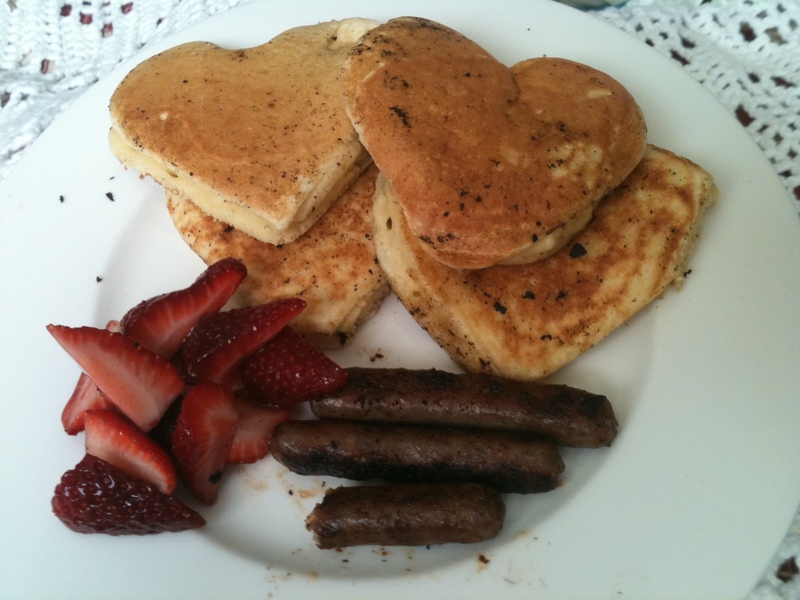 My youngest made me breakfast in bed – apple pancakes, sausage and juice. She was so sweet. She was concerned that the pancakes hadn’t turned out right. I took a bite and her suspicions were confirmed. My plate was whisked away and she whipped up an entirely new batch of pancakes which we shared in my bed. She was feeling bad about it until I reminded her that she doesn’t yet know the universal truth of motherhood – in the future I may forget what she made me for breakfast, but I’ll never forget the love that I felt. This is last year’s breakfast. My husband and kids made pork chops and mashed potatoes for dinner which is one of my favorites. My mom came over and we opened cards from the kids (me being one of the kids). Best of all, I don’t have to do the dishes! !